The Government of AP State is going to conduct AP State Teacher Eligibility Test and release a Notification in concerned to AP TET Notification 2017. It is a chance for getting eligibility to apply for AP DSC. Department of School Education DSC announced APTET Notification 2017 for AP State Eligibility Test. The State Government of AP has updated the APTET application form 2017 at its Official Website . So, that applicants can apply quickly. All the aspirants can apply online for this test only through Online mode only at www.aptet.cgg.gov.in . All the applicants must remember that they have to submit their AP TET Online application 2017 form till the day given in the Notification. Aspirants who want to apply for AP TET 2017 , have to know what details are required to fill the online application form. 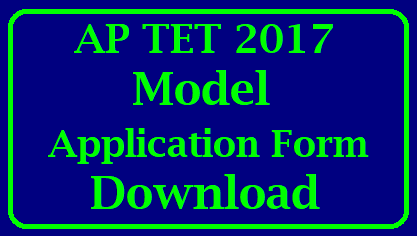 For this , here we are providing with a model application form where the aspirants who are going to apply for AP TET 2017 have to fill this application form manually and carry with them , so that it will be easy while filling the information in the online application form. Applicants who are curious to apply online for AP TET Registration Form 2018 they must know that only eligible applicants can apply for this examination. If you meet all the eligibility conditions of the TET examination then you can apply through online mode by submitting the online application form. With the help of following steps, you can easily apply for the TET examination. Willing candidates need to browse the official website of Commissioner of School Education Andhra Pradesh Teacher Recruitment Board the Higher Education Board of Andhra Pradesh that is aptet.cgg.gov.in. Then go to the homepage and find out AP TET Application Form 2018 Notification link. After that, open the notification in the next web page and Read the notification very carefully before applying for the post and if you are eligible then click on an apply online tab. Now fill all asked details in the AP TET Application Form 2018. Attach the all required credential scanned copies with the application form. *Dec 18 నుండి దరకాస్తుల స్వీకరణ ప్రారంభం..
* అన్ని వివరాలు సరిగా ఉన్నాయో లేదో చూసుకుని submit చేయాలి. లోకి వెళ్లి make payment click చేయాలి..
* మీరు మీ ఎటిఎం కార్డ్ లేదా నెట్ బ్యాంకింగ్ ద్వారా చెల్లించవచ్చు. * తరువాత మీకు journal number వస్తుంది.దాన్ని ప్రింట్ చేయండి లేదా రాసుకోండి..